Casumo is a Scandinavian operator that set up shop in 2012 and has enjoyed plenty of success ever since. To attract players’ attention, the casino has run a series of unusual marketing campaigns, such as the eccentric Play Absurd advertisements, which made it clear that they were quirkier than most. To back this up, it has amassed a large gaming library and is licensed in the UK and in Malta. This means that player safety is well protected, and the casino is obliged to take its responsibilities seriously in terms of fairness. Outcomes across the site are produced by a random number generator, which is regularly inspected by a third party. In the past, Casumo has not made as many bonuses available to its players as other casinos, but it makes up for this by being especially generous with the bonuses that it does provide. Moreover, the casino has created an adventure-style rewards system that marks out players’ achievements and provides a huge range of prizes. Any bonus awarded is only valid for six months. The Casumo Welcome Offer is only available to members who have completed the full registration process and agreed to the casino’s terms and conditions. Any new players who sign up will be given access to a bonus totaling 20 bonus spins, which are offered immediately. When they make an initial deposit, they will receive 100% on that amount up to a maximum of £300. The minimum deposit is £10, and there is a specific procedure to follow when opting in. To find the Welcome Offer, new members need to visit the My Stuff area. From here, they have to click the Welcome Bonus button, and this must be completed prior to making a deposit. The 20 bonus spins are on Starburst and they will appear as soon as registration is complete. 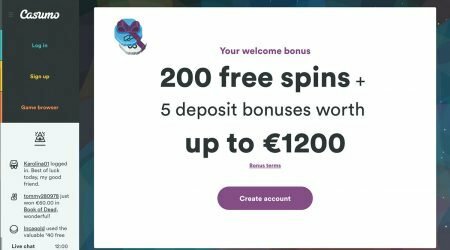 Members activate the spins by clicking their username, which appears in the left-hand menu, and then selecting Your Stuff, followed by the 20 Bonus Spins button. Once this is complete, the spins are active and players are redirected to the Starburst game automatically. Once a player has activated their bonus spins and enjoyed their gratis rounds on a game, any winnings are converted into bonus money, rather than real cash. Bonus money won in this way has a wagering requirement of 30 times the original bonus amount. 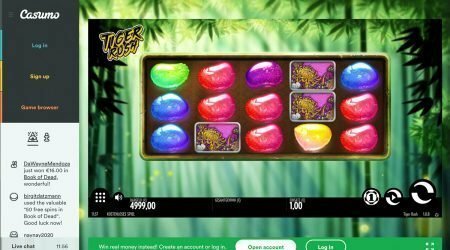 It is not possible to withdraw any winnings until the original deposit amount and the bonus money have been wagered 30 times over. For players who choose to withdraw their initial deposit, the bonus becomes void and the money is lost. The majority of games at Casumo do count towards their wagering requirements, but there are exceptions and games will contribute at different rates. Games that do not contribute include Dead or Alive, 1429 Uncharted Seas, Scrooge and Pearls of India. To mark itself out from other casinos, Casumo has created what it calls the World’s First Casino Adventure. It’s somewhat of a marketing gimmick, but still represents a fun way for players to receive rewards for their loyalty. The more they play, the more trophies they collect, and these can net them bonus cash or extra rounds. The more time that members spend online at Casumo also influences the rate at which they will win rewards. The amount of time or number of plays needed to level up is shown in a progress bar. As fresh levels are reached, new and potentially more valuable prizes are obtained. Casumo provides players with a few novelty ways of measuring their success, including belts, trophies, and valuables. Everyone starts off trying to win a white belt, before working their way through the colours to black. Trophies are won by performing tasks on the site and can be displayed publically to other members. Finally, valuables such as bonuses, extra spins, and bonus cash are stored in the Valuables tab of each account. Players click on these to access the prize. 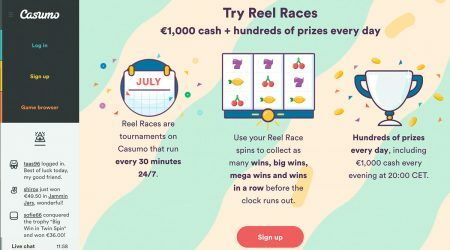 Reel Races is another promotion that runs daily. Much like a tournament in a traditional casino, players aim to win as often as possible within a set timeframe. It is free to opt in, and the winner is decided by total points – two points are awarded for normal wins and 20 for larger ones. Players who have a number of concurrent wins get even more points. Reel Races are held multiple times throughout the day and are open to all account holders. Players who finish first past the post are given cash rewards. In the past, the top prize has been £5,000, though it is usually lower. Players don’t need to install or download any special software in order to access the games at Casumo as they can be played from within a browser. At any one time, there are around 850 games to choose from, but these are regularly added to, so everyone can find a title that appeals. The Casumo game library includes a huge range of slots, along with a good choice of table games to add variety. 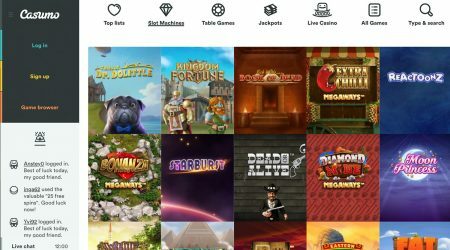 Like the majority of other online casinos, Casumo has plenty of recent slots for people who want to try out the latest releases, but its classic collection is just as packed. The video slot area includes NetEnt titles such as Gonzo’s Quest, Jack and the Beanstalk and Mega Fortune. Larger payouts are also on offer with progressive slots, such as Hall of Gods, Mega Moolah and Mega Fortune, which from time to time deliver huge rewards. Some players like to diversify their gaming, and at the classic casino, it is possible to try out a range of golden oldies such as blackjack and roulette, presented in various forms. Some of the most popular are Blackjack Pro, Blackjack HD and French or American Roulette. For poker fans, the line-up features many types of poker, including video poker. Elsewhere, All American, Deuces Wild, Texas Hold’em and Jacks are on offer, with Live Blackjack or Live Roulette making up the main live section options. To make a deposit at Casumo, players can select their balance from the menu, and then choose a payment method. The casino accepts Visa, Mastercard, paysafecard and mobile payments. All deposit methods are free, and the funds are immediately available in the member’s account. When players want to withdraw their winnings, payments are made through the method they used to place their deposit. Most requests are answered within 24 hours, but it can take up to five working days for the money to appear in a member’s bank account. Once the request is made, the corresponding amount is ring-fenced, so it cannot be wagered along with any remaining balance. Casumo wants to keep its players happy by providing great customer support, and hopes to treat each person contacting them as an individual. The site is available in Finnish, Swedish and Norwegian for people whose first language is not English, and customer support is also provided in these languages, as well as English. At the moment, Casumo does not have a telephone number for its members to call, which is always a disappointment, but there is a well-written FAQs section. Here, it is possible to search for an answer based on a keyword, and most aspects of the site, accounts and games are covered. In fact, Casumo asks players to look through the FAQs section prior to making contact as so many of the most common issues are mentioned there. Casumo online casino is noticeably different from the competition. By choosing to combine the individual slot or table games with an adventure-themed challenge, Casumo has created a new experience for its members. It is an original product that could be a powerful lure all by itself, but Casumo has backed up the fun element of the casino with cool graphics and a straightforward layout. Navigation from one area to the next is simple, and when help is needed, there is a range of customer support options. To keep things visibly fair and above board on the platform, Casumo holds one licence in Malta and one in the UK. These official authorisations should help players to feel secure when handing over their personal details and financial information. The bonuses come with significant wagering requirements, but this is standard for the industry, and the package of 20 free spins gives new members the chance to learn more before making their first deposit. For those who want a change of atmosphere or are seeking a more immersive experience, Casumo is a great choice. This is an extremely creative casino with plenty of variety and a commitment to player safety.